1. Wash and drain green beans. Take off the ends. 2. Peel potatoes, and dice finely into 1 cm squares. This is very important for the end result. 3. Boil water in a pot. Add coarse salt. 4. When water boils, add pasta, potatoes and green beans together. The Barilla trofie take about 10 minutes to cook, and in this case, the amount of time was enough for cooking green beans and potatoes (remember to cut potatoes small!). If you are using fresher trofie – or another type of pasta that takes less time to cook – you need to adjust the timing when adding green beans and potatoes to the boiling pot (if the pasta you are using cooks in 5 minutes, add vegetables 5 minutes before). 5. When pasta is al dente, drain all three ingredients, saving about a cup of cooking water for later. 6. Blend with pesto, adding water little by little to let all the ingredients amalgamate well. So what about the use of potatoes? When blending all ingredients together, potatoes crumble and add their starches thickness to the dish, making it richer and heartier! Thank you! It was delicious! Try it! 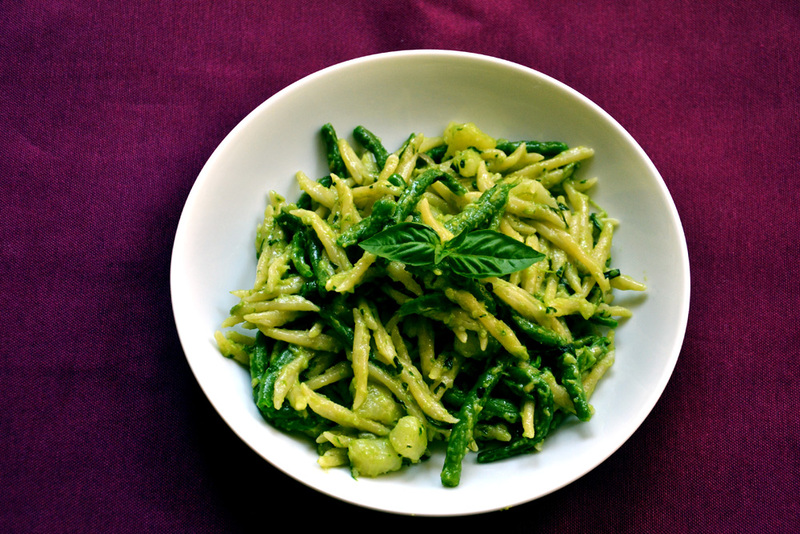 The beautiful green of the pesto and beans just looks so summery! I love this pasta dish especially with the trofie pasta. I’ve heard of potatoes on pizza but have never had it in my pasta! Sounds like a dish i must try! It is very summery indeed. Potatoes are not a common ingredient in pasta so I was very curious to try this recipe out and it paid! What yummy and tasty looking pasta! Yes this dish has a plus.- it is easy since you cook altogether. The only thing you have to prepare is your pesto! Oh, by the way, when I prepare pesto I eat some of it with a piece of bread! Hi Roger! You can try it with a spiral pasta such as fusilli or any twisted, helix or corkscrew shape! The important thing is that pesto clings well to pasta! I suggest you to try it. It does have a similar effect as untoasted bread crumbs on pasta…remember? I knew that trenette were often served with pesto but this dish is new to me. I’ll have to ask Zia if she’s familiar with it. Even if not, I’m sure we’ll try it. The flavors sound delicious and both of us love pesto. We have it at least once whenever I visit her. You should definitely try trofie and I am sure you can find them in Chicago, or even better you can make them from scratch! It sounded easy enough for me to handle. Love the green color of the pesto. It looks delicious and sounds a winner to me! I’m wondering what kind of poatoes you used? Hi! Thank you! I used yellow potatoes and they just worked really well! I still remember eating trofie pasta while overlooking the Mediterranean. Yours looks great! Hi Joshua! Welcome back! Thank you! 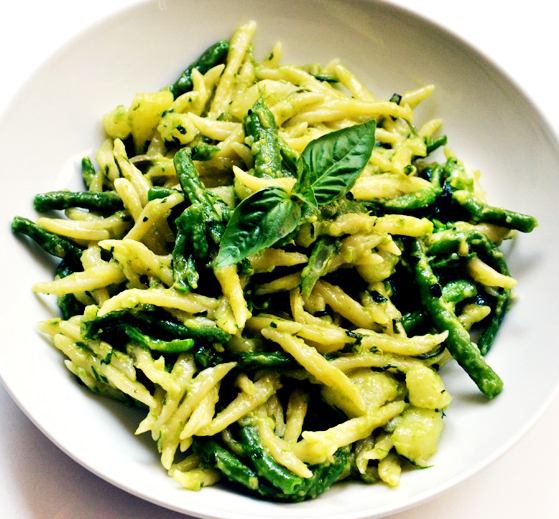 I think that when you eat pesto the concentration of flavors recalls the Mediterranean! I had this dish a few years ago while we were in Italy and it was very good. It is nice to have the recipe…thanks Ambrosiana. You are welcome Karen! I hope you can enjoy it again! Thank you Spree! You are so kind! You have just givien a n excellent analysis of the dish! i don’t find it weird that potatoes were added to a pasta dish. i eat potatoes with rice or bread sometimes. personally, i’m only just now getting into the pesto thing. i enjoy it’s versatility, as evidenced by this dish. To me it was! I was even used to see French fries on pizza! Thanks for stopping by! It is a very interesting pairing. When potatoes are cooked and miexd with pasta, its starches act as a glue, blending all ingredients togheter! please update your blog now, it’s wonderful!